It's wonderful to have an award winning Elvis Tribute Artist on our stage to celebrate Elvis' Birthday, but it's absolutely amazing to have TWO!! Rob Knight, a favourite on the Riviera Nayarit, teams up with longtime friend and singing companion Dino Macris to bring you the most incredible evening celebrating what would be the King's 81st birthday. This was one of our most popular shows of last season and tickets sold out fast. Book early to avoid disappointment. Rob Knight, originally of Alberta Canada, now lives in the Bay of Banderas area. Rob is known for his infectious smile and powerful voice and was awarded the Pacific Northwest Elvis Tribute Artist Championship in 2014. He sings every song with spirit and heart during his outstanding stage performances of "Elvis, The Concert Years" and his "Elvis Inspirational Gospel Tribute" singing the songs that Elvis cherished so much. Dino Macris, of Washington State, has been singing since the 1970's. He has brought the memories of Elvis to life on many stages with his velvet voice and charisma. Dino is a three time Champion Elvis Tribute Artist and was awarded the prestigious Heart of Elvis Award in 2014. 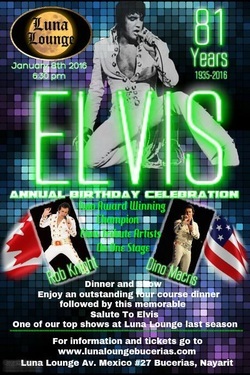 He currently resides in the U.S. and tours extensively with his Elvis Tribute Shows.